Safety can be clearly seen from the beginning of each morning's safety meeting through each project's close out. Our team is committed to performing our work safely the first time, every time. Force Drilling is uniquely positioned to provide turnkey geotechnical construction solutions in any location. Our in house engineers and experienced field leadership team believe in partnership from day one. Call us today to experience the Force difference. Ground conditions vary greatly, sometimes within the same construction site. Force Drilling, LLC provides solution using the latest ground treatment, ground reinforcement, and structural support technologies. Personnel work closely with engineers, contractors, and owners to ensure that the geotechnical construction minimizes impact on normal facility operations. 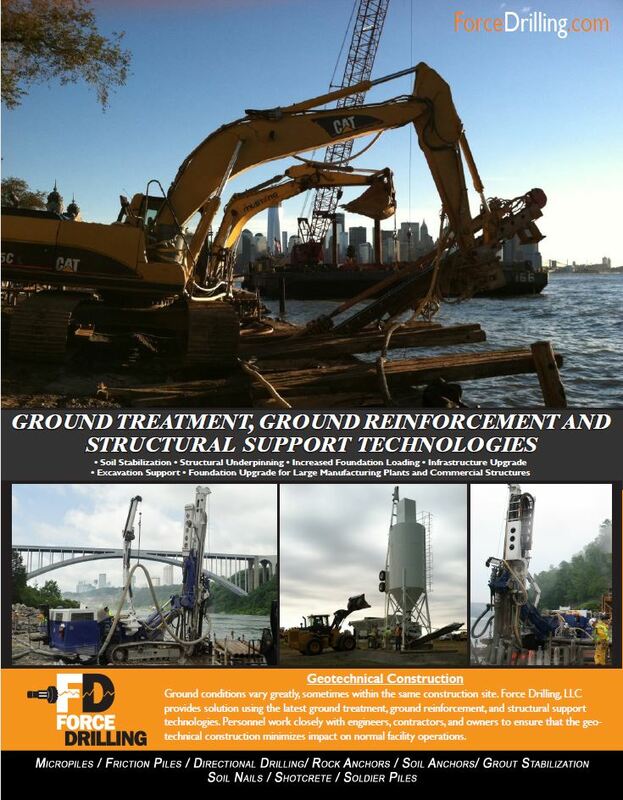 Force Drilling, LLC is a national leader in ground treatment, ground reinforcement and structural support technologies. Visit our Services page to learn how Force Drilling can deliver solutions for your project today.